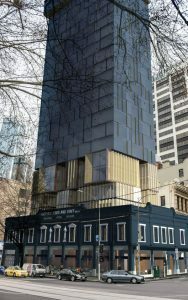 Construction has started on a new Vibe Hotel that melds history, contemporary design and an inner city lifestyle, at the former Fletcher Jones showroom in Melbourne. Caydon Property Group’s design team will preserve the 145-year-old building’s façade and add a 24-storey glass fronted tower with four distinct design sections marking the links between old and new. Its upper levels will take in views of the Yarra River to Port Phillip Bay, while its dual frontage ensures city views to the north and south-east. 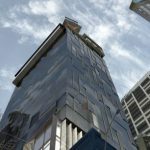 The hotel is set to open in late 2019 at the corner of Queen and Flinders Streets. The original two-storey building on the Queen Street site was built in 1873 in the Renaissance Revival architectural style and was called the Cobden Building, first serving as offices for the maritime trade. In 1955, clothing manufacturer and retailer Fletcher Jones bought the building for $260,000, and it became an iconic fixture for Melbourne shoppers. At its peak the company employed 2700 employees and ran 55 stores, using the building as its main city showroom until the company’s collapse in 2012. It was then occupied by hip streetwear brand Culture Kings. Next generation Vibe Hotels offer spaces where lifestyle, design and technology come together as one, allowing guests to connect and disconnect as they wish. In keeping with this brand ethos, the new Vibe Hotel Melbourne has 206 inspired rooms, contemporary communal areas and a building design that tells a story via four distinct “layers” or strata. The first strata is Heritage, where the existing building will be rendered in beautiful classic steel blue and off-white, with touches of chrome and metal. The second is Transition, the bridge between old and new, marked by external stone fins, bronze glazing and black window frames. The Tower level is a modern masterpiece, with protruding window jambs in black and bronze that beautifully complement the light grey pleating in the façade. The Crown is the final statement, with a light grey glazing and black window framing, marked by a timber vertical screen and a finished concrete spandrel. TFE Hotels CEO Rachel Argaman said this marked a great year for the Vibe Hotels brand, which is growing from nine hotels to twelve. The Vibe Hotels brand launched in Sydney in 2003 with the opening of Vibe Hotel Rushcutters Bay, which was followed by three more hotels in Sydney, Hobart and Melbourne the next year. Hotels opened later at Darwin Waterfront, Canberra Airport, which has since won multiple design awards, and at Marysville near Victoria’s Yarra Valley, which has a beautiful bushland outlook and conference centre. Vibe Hotels are where lifestyle, design and technology come together as one, so guests can connect and disconnect as they wish. Experiences are designed to be shared, with spaces and activities to enrich each stay. Immersive design and inspirational hubs bring people together, whether it is for quality time with loved ones or to connect with other guests. At Vibe Hotels, guests can inspire their inner foodie or nourish their creativity. These hotels have innovation and modern design at their hearts, corresponding to the spirit of the millennial mindset. Vibe Hotels are in nine locations: Melbourne, Sydney, Rushcutters Bay Sydney, North Sydney, Gold Coast, Darwin Waterfront, Canberra and Marysville (Victoria). Three more next generation Vibe Hotels are under construction in 2018 – Argyle Street in Hobart; Queen Street in Melbourne; and Sydney’s Darling Harbour. Major refurbishments will be unveiled soon at the Gold Coast and Sydney.